Combine the first 5 ingredients in the bowl of a stand mixer with a paddle attachment, and mix until it resembles a coarse meal. Add the liquids and mix until dough barely comes together. Flatten the dough and wrap in plastic. Refrigerate for a minimum of 1 hour. Roll the dough into six ¼- to 3⁄8-inch-thick circles, about 6 inches in diameter. Refrigerate again. Prepare the apple filling according to the directions that follow. Place the dough circles on a baking sheet and divide the cooled apples among them. Fan or shingle the apples, keeping ½ inch of the outer circumference of dough free of apples. lift the sides of dough up and over the apples covering the outer one-half of apples. lightly sprinkle granulated sugar over sides of dough. Chill the galettes for 10 minutes. Preheat oven to 350° F. Bake for 10-14 minutes or until golden brown. Sauté the apples in butter on high heat until they start to brown. Add the sugars and vanilla bean and allow to lightly caramelize. Transfer the mixture to a stainless steel container, zest the lemons over the apples and cool. Cook’s tip: I recommend Cup 4 Cup or King Arthur gluten-free flour. Baking time: 10 to 14 minutes. Chilling time: 1 hour (dough), 10 minutes (galettes). 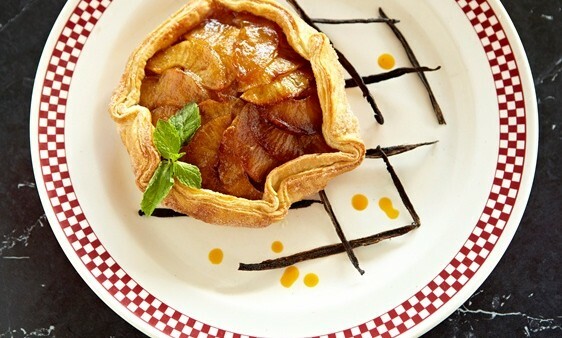 Recipe by Tracy Kamperdyk Assue, the executive pastry chef for City Limits in White Plains, New York, and Stamford, Connecticut.